The failure to learn and change is exemplified with one particular client; a professional services firm who called needing interim HR management assistance as their HR leader had just resigned. We soon discovered a history of HR leaders leaving after 18 – 36 months. Further, after assuming the HR function, we determined that the majority of the HR work was routine and administrative with the occasional involvement in strategic guidance, new policy development or executive recruitment. The firm traditionally hired an experienced HR person with the expertise to operate at the strategic level, but did not provide her with any administrative support or allow her to become involved in operations unless specifically requested by a senior executive. The inevitable result was an HR Director type person spending most of their time doing data entry and answering routine benefit questions. Further frustrated by seeing organizational issues that she could address, but is not authorized to, she eventually leaves. Based on the evidence, we recommended that the firm hire someone with the appropriate skills and interest in doing the administrative work and outsource the strategic work (to us of course). The client decided to continue with their past strategy and hired a person who subsequently left in nine months. We were called back in for interim support, repeated our recommendation, which was again ignored and they hired someone who lasted 16 months. Seemingly irrational decisions such as these can frequently be explained by conscious and unconsciously held individual and organizational values. To understand and remedy these secret drivers of performance requires a model and an assessment process. In his work to explain the previously incomprehendable, Richard Barrett turns the traditional human motivation model literally upside down. Founder and Chairman of the Barrett Values Centre www.valuescentre.com, his Seven Levels of Consciousness model takes Abraham Maslow’s familiar pyramid of the hierarchy of needs and stacks on an upside down pyramid transporting us from self-focused to other-focused values and behaviors. Based on the principle that people and groups are constantly working to meet their internal and external needs for surviving and thriving, Barrett has developed a psychological construct that moves through various levels from 1 to 7 in a progressive, but not linear manner. What this means is that once a need like financial survival has been met, it doesn’t mean that it can now be ignored, it simply means that particular area is routinely cared for and attention can be paid to higher level values such as relationship building. On the other hand, if a need, for example self-esteem is not cared for, the attempt to fulfill that need will regularly reappear in behaviors and decision-making. The model is designed to be applied to individuals, organizations, and communities. 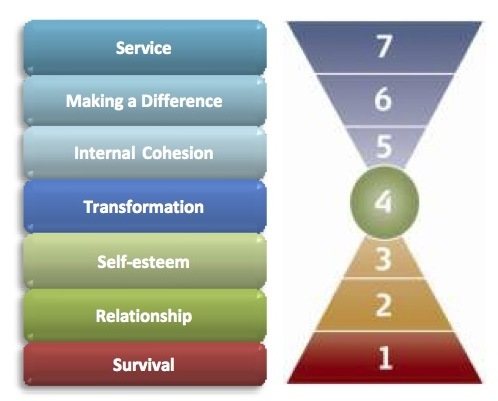 The organizational themes build from a survival mode at Level One emphasizing physical and financial security values to Level Two of relationship building followed by Level Three labeled self-esteem and defined organizationally as the establishment of high performance systems and processes. Level Four marks the transition from inward focus to external concerns highlighting teamwork, accountability and continuous improvement. The internal cohesion at Level Five is characterized by integrity, a sense of purpose and shared vision. Level Six values prompt leaders and groups to extend beyond their boundaries for coaching, mentoring and community care. The top Level Seven values of selfless service are exemplified by a commitment to social responsibility and the long term ethics. The first three levels are considered deficiency demands. They are required for continued existence, but there is no on-going satisfaction derived from meeting these needs, though there may be deep anxiety if they are not met. The transformational level denotes a shift from fear‐based, rigid, authoritarian environments to more open, inclusive, adaptive systems. The growth needs represented at levels five through seven, focus on cultural alignment, building alliances and sustainability. Fulfillment of these needs is self-reinforcing promoting ever-greater cycles of commitment and engagement. Organizations with values clustered at the bottom levels are not usually market leaders because they too self‐absorbed, autocratic and bureaucratic to the generate energy, creativity and a sense of ownership necessary for major achievement. Organizations hovering exclusively at the top levels may lack the basic business skills and capabilities necessary for strong operational execution due to weak financial and accountability systems and unreliable customer service. Successful organizations are those that have mastered both their lower level requirements and their upper level motivations and are described as operating from full spectrum consciousness characterized by trust, the ability to manage complexity and adaptability. How would you categorize the values of your organization? What about your personal values? Is there alignment in these distributions? To conduct a quantifiable assessment of your organizational and leadership values, please contact us to discuss the simple and brief online administration process. This entry was posted in Individual and Team Performance, Leadership Development, Organizational Culture and tagged corporate culture, leadership, organizational performance, organizational values. Bookmark the permalink. ← Microsoft versus Yahoo Performance Management Systems…Who is right?